Not to be confused with Santander Network. The Santander Group /ˌsɑːntɑːnˈdɛər/ is a Spanish banking group centered on Banco Santander, S.A. (Spanish: [ˈbaŋko santanˈder]). As its name suggests, the company originated in Santander, Cantabria, Spain. Banco Santander was founded in 1857. In 1999 it merged with Banco Central Hispano, which had in turn been formed through the 1991 merger of Banco Central and Banco Hispanoamericano. The combined bank, known as Banco Santander Central Hispano, or BSCH, was designed to be a "merger of equals", in which the top executives of the two pre-existing firms would share control of the merged entity. Soon after the merger former BCH executives accused Banco Santander chairman Emilio Botín of trying to push his own agenda and threatened to take legal action. This post-merger disagreement was resolved when BCH executives Jose Amusátegui and Angel Corcóstegui agreed to accept severance payments, retire and pass control to Botín, at an expense to shareholders of €164M. The large termination payouts generated negative press and Botín was eventually brought to trial on criminal charges of "misappropriation of funds" and "irresponsible management." 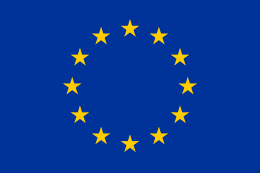 However, in April 2005 the court cleared him of all charges, the €164M retirement payments made to the two former executives were legal, "made as compensation for the services provided to the bank." Also that year, the anti-corruption division of the Spanish public prosecutor's office cleared Botín of all charges in a separate case, in which he was accused of insider trading. In 2007 the bank officially changed the official name back to Banco Santander S.A.. In 1996 Banco Santander acquired Grupo Financiero InverMexico. In 2000, Banco Santander Central Hispano acquired Grupo Financiero Serfin of Mexico. On 26 July 2004 Banco Santander Central Hispano announced the acquisition of Abbey National plc. Following shareholders' approval at the EGM of Abbey (95 per cent voted in favour, despite vocal opposition from most of those present) and Santander, the acquisition was formally approved by the courts and Abbey became part of the Santander Group on 12 November 2004. In June 2006, Banco Santander Central Hispano purchased almost 20% of Sovereign Bank and acquired the option to buy the bank (at the time, the market value was roughly US$40 per share) for one year beginning in the middle of 2008. In May 2007 Banco Santander Central Hispano announced that in conjunction with The Royal Bank of Scotland and Fortis it would make an offer for ABN AMRO. BSCH's share of the offer added up to 28% and the offer would have to be made up of a capital increase through a new share issue. Then in October 2007 the consortium outbid Barclays and acquired ABN AMRO. As part of the deal, Grupo Santander acquired ABN AMRO's subsidiary in Brazil, Banco Real, and its subsidiary in Italy, Banca Antonveneta. On 13 August 2007, Banco Santander Central Hispano changed its legal name to Banco Santander. In November that year, it sold Banca Antonveneta to Banca Monte dei Paschi di Siena, excluding a subsidiary Interbanca. 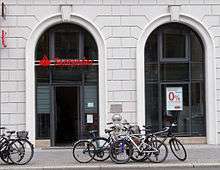 In March 2008, Banco Santander sold Interbanca to GE Commercial Finance, receiving in return GE Money businesses in Germany, Finland and Austria, and GE's card and auto-financing businesses in the UK, which it integrated with Santander Consumer Finance. In July 2008 the group announced it intended to purchase the UK bank Alliance & Leicester, which held £24bn in deposits and had 254 branches. Santander also purchased the savings business of Bradford & Bingley in September 2008, which held deposits of £22bn, 2.6m customers, 197 branches and 140 agencies. The acquisition of Alliance & Leicester completed in October 2008 when the B&B's shares were delisted from the London Stock Exchange. By the end of 2010 the two banks merged with Abbey National under the Santander UK brand . In October 2008, the Group announced to acquire 75.65% of Sovereign Bancorp it did not own for approximately US$1.9 billion (€1.4 billion). Because of the 2008 financial crisis at the time, Sovereign's price-per-share had fallen greatly: Rather than the $40 per share it would have cost in 2006, Banco Santander ended up paying less than $3 per share. The acquisition of Sovereign gave Santander its first retail bank in the mainland United States. Santander renamed the bank to enhance its global brand recognition in October 2013. On 14 December 2008, it was revealed that the collapse of Bernard Madoff's Ponzi scheme might mean the loss of €2.33 billion at Banco Santander. On 10 November 2009, HSBC Finance Corporation announced its auto finance entities had reached an agreement with Santander Consumer USA Inc.(SC USA) to sell HSBC US auto loan servicing operations, US$1 billion in auto loan receivables for US$904 million in cash, and enter into a loan servicing agreement for the remainder of its liquidated US auto loan portfolio. The transaction closed in the first quarter of 2010. In September 2010, Santander purchased Bank Zachodni WBK from Allied Irish Banks. On 28 February 2012, Santander announced that it had reached an agreement with KBC Bank to buy KBC's subsidiary Kredyt Bank in Poland. Santander merged Bank Zachodni WBK and Kredyt to create Poland's third-biggest bank, valued at about €5bn (US$6.7bn), having a market share of 9.6% in deposits, 8.0% in loans, 12.9% in branches (899), and more than 3.5 million retail customers. As a result of the merger, Santander came to hold 76.5% of the combined bank, and KBC came to hold about 16.4%; other shareholders held about 7.1% of the shares in the combined bank. Santander stated that it intended to buy more of KBC's shares in the combined bank to bring KBC's holdings below 10%; KBC affirmed it intended to sell its remaining stake. KBC sold its shareholding and Santander owns 75% of the bank, the rest is free float. In October 2013, Santander acquired 51% in Spain's largest consumer finance business, El Corte Inglés, for around €140 million. In June 2014 Santander bought GE Money Bank, GE Capital's consumer finance business in Sweden, Norway and Denmark, for 700 million euros ($950 million). In September 2014, it was announced that Santander was in talks to merge its asset management unit with that of Unicredit to create a European firm worth €350 billion in assets. In November 2014, Banco Santander acquired a 5.1 percent stake in Monitise plc for £33 million. In December 2012, Banco Santander announced that it would absorb Banesto and Banco BANIF, purchasing the remaining 10% of Banesto it did not already own. The Santander Group operates across Europe, Latin America, North America and Asia, partly due to its acquisitions. As of 2013 it had more than 186,000 employees, 14,392 branches, 3.26 million shareholders and 102 million customers. Retail banking – the main aspect of Santander's operations – generates 74% of the group's profit. 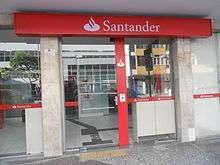 On 10 June 2010, Grupo Santander announced to invest approximately US$270 million (€200 million) in Campinas, Brazil in a technology centre for research and data processing and a data centre, that was to support operations across North America, Central America and South America. The new centre was to be established within the 'Development Company for High Technology Cluster of Campinas' on 1 million square metres. Construction began in January 2011, and full operation was expected in 2013 offering over 8,000 direct and indirect jobs. In 2013, global growth equity firm General Atlantic, along with Warburg Pincus LLC, acquired a 50% stake in Santander Asset Management. Santander is a corporate sponsor of the Ferrari and McLaren Formula One teams, and also sponsors the Copa Libertadores de America, Copa Sudamericana, and the Recopa Sudamericana. The group had announced on 1 December 2008 that their Formula One sponsorship deal with McLaren would end in 2010, when Santander would become Ferrari's main sponsor. However, in September 2009, Santander announced it would continue to sponsor McLaren alongside Ferrari due to its brand awareness in the UK rising from 20 to 82 percent. Best Banking Performer, Spain in 2016 by Global Brands Magazine Award. 1 2 3 4 5 "Annual Report 2015" (PDF). Santander plc. March 2016. ↑ "Global 2000 Leading Companies 2011". Forbes. Retrieved 2013-07-14. 1 2 3 Mauro F. Guillén, Adrian Tschoegl (2008). Building a Global Bank: The Transformation of Banco Santander. Princeton University Press. ISBN 9780691131252. ↑ "El Santander cierra la compra del 75% del Banco Mexicano". El País (in Spanish). 24 October 1996. Retrieved 15 April 2016. ↑ KRAUL, CHRIS (2000-05-09). "Mexican Banking Deal Reflects Brighter Outlook". Los Angeles Times. ISSN 0458-3035. Retrieved 2015-03-01. ↑ "Santander scraps UK bank brands". BBC News. 27 May 2009. Retrieved 23 May 2009. ↑ Noreen O'Leary (16 August 2012). "Sovereign\Santander Picks New Agency". Adweek. Retrieved 3 September 2012. ↑ "Santander Clients Have $3.1 Billion With Madoff (Update1)". Bloomberg. 14 December 2008. ↑ Carlos Ruano (8 October 2013). "Spain's Santander to buy 51 percent of El Corte Ingles finance arm". Reuters. ↑ Paul Day; Jesus Aguado (23 June 2014). "Santander to buy GE consumer finance business in Northern Europe". Reuters.com. Retrieved 27 June 2014. ↑ "UniCredit, Santander in talks to merge asset management units" (Press release). Reuters. 23 September 2014. ↑ "Santander takes five percent stake in mobile banking firm Monitise" (Press release). Reuters. 27 November 2014. ↑ "Santander absorbs Banesto and Banif and shuts branches". BBC News. 17 December 2012. Retrieved 29 September 2014. ↑ "Key data". Santander Group. 2013. Retrieved 1 March 2013. ↑ "Santander investirá R$ 450 milhões em pólo de tecnologia, pesquisa e processamento em Campinas" (PDF) (in Portuguese). Santander. 2010-06-10. Retrieved 2013-07-14. ↑ Dezember, Ryan. "Warburg, General Atlantic Buy Half of Santander's Asset Management Arm". The Wall Street Journal. Retrieved 16 December 2015. ↑ "Corporation Sponsorship". Santander Group. 2013. Retrieved 26 September 2013. ↑ "Santander extends McLaren partnership". Formula 1. 2009-09-14. Retrieved 2013-07-14.